The lack of efficiency encountered in some bureaucratic systems never ceases to amaze me. Over a decade ago I worked for the Town of Banff on the receiving end of applications like the one that I recently submitted for 205 Crichton Street. Back in the day, we were experimenting with the submission of development applications in electronic format. In the last decade this has become common practice, a requirement even in some municipalities. I do not understand why the City of Ottawa burdens applicants with the unnecessary expense of printing multiple hard copies of complex application packages. 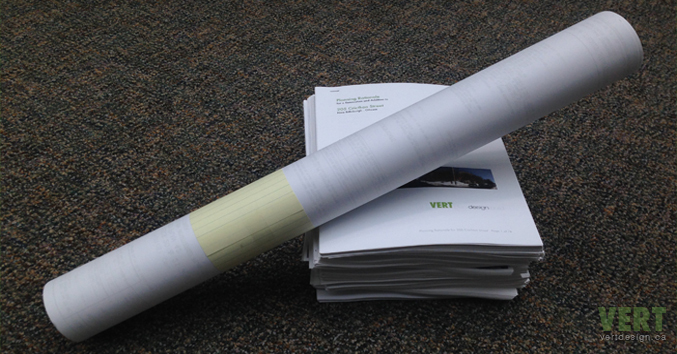 The pile of paper pictured in this post is only a half of the pile that was submitted to the Committee of Adjustment. For the $1,000 that was spent on printing Minor Variance and Consent application packages, I could have bought iPads (loaded with my application and supporting docuemnts) for at least two of the five Committee of Adjustment members. The next two applicants to come to the desk could outfit the rest of the committee members with their iPads. In by transferring the printing cost of just a few application packages to the purchase of tablets, the cost of printing future applications could be eliminated. Perhaps members of the Committee would need a half day of training in the use of their new technology, and a few staff would need them as well. I guess the cost just jumped slightly. Regardless; it is time for City staff to unshackle themselves from their printers and find some efficiency (not to mention economy) in leveraging some simple technology. Enough of my ranting. 1. Does the proposal maintain the general intent and purpose of the Official Plan? The proposed development would demonstrate a compatible form of modest intensification within the urban area, as directed by policies for Managing Growth Within the Urban Area (Section 2.2.2), while supporting policies for Maintaining Environmental Integrity (Section 2.4). If approved, the proposed development may become the first building in Canada located within a heritage conservation district to receive the LEED for Homes Platinum certification and the Passive House certification – two of the highest levels of achievement for green building in the world. 2. Does the proposal maintain the general intent and purpose of the Zoning By-law? Our proposal adheres to the purpose of the applicable zones (By-law 08-250 R4S ZONE) by contributing to the creation of “a wide mix of residential building forms” (By-law 08-250 Section 161), through the construction of a semi-detached building within one block of other semi-detached buildings, multi-unit residential buildings, and detached dwellings. Our intention to create a compatible form of intensification requires us to seek minor variances, since the form of development characteristic of the New Edinburgh neighbourhood does not conform to some provisions of the zoning by-law. 3. Is the proposal desirable for the appropriate development or use of the land? Our applications seek only to vary the zoning by-law provisions in a manner that is characteristic of the neighbourhood. 4. Is the proposal minor? The extent of the impact of the proposed development on neighbouring properties and the neighbourhood as a whole are minor or nonexistent. The mass and height of the proposed development will not create any significant issues for abutting property owners related to loss of sunlight, privacy or views. The proposed density of the development is similar to or less than the established norms of the neighbourhood. The proposed development would not create any negative impacts related to access, trees, parking, drainage, traffic or noise. The proposed development is compatible with the established built form and character of the neighbourhood and serves to improve the affected streetscapes.